In Meghalaya, the opposition Congress will organize a protest against the decision of Karnataka Governor, Vajubhai R Vala, who invited the BJP to form government in the State by rejecting the Congress-JD(S) combine. The protest will be held at Congress Bhavan in Shillong on Friday at 11.30 am. Congress leaders informed on Thursday that the Meghalaya Pradesh Congress Committee (MPCC) will also submit a petition to the President, Ram Nath Govind through the Governor, Ganga Prasad to urge him to save democracy. 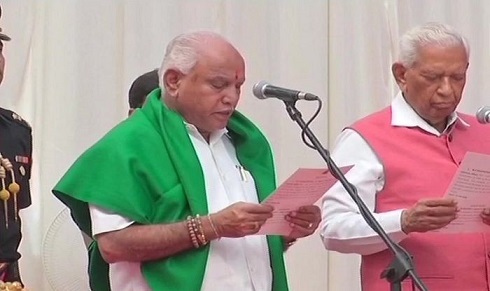 Karnataka Governor invited the BJP to form the government being the single largest party with 104 seats and BJP leader, BS Yeddyurappa was sworn-in as the Chief Minister of Karnataka on Thursday morning. The Governor did not invite the Congress-JD(S) combine which has a total of 116 MLAs, more than the halfway mark of 112. The Congress demanded that since the BJP in Karnataka has been allowed to form the government for emerging as the single largest party, the Congress in Goa, Manipur and Meghalaya should also be invited to form government since the party has won more seats than other parties in these States too. As per media reports, the Supreme Court on Thursday gave the Attorney General 48 hours to produce the two letters written by the newly sworn-in Karnataka Chief Minister BS Yeddyurappa to the Karnataka Governor staking claim to form government in the State. The Attorney general will have to procure the documents from the Governor and produce them before the apex court on May 18 at 10.30 am.